Early administration of neuraminidase inhibitors in adult patients hospitalized for influenza does not benefit survival: a retrospective cohort study. Early administration of neuraminidase inhibitors in adult patients hospitalized for influenza does not benefit survival: a retrospective cohort study. 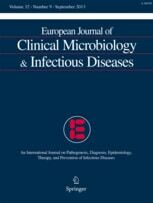 Choi SH, Kim T, Park KH, Kwak YG, Chung JW, Lee MS. Eur J Clin Microbiol Infect Dis. 2017 Apr 18. doi: 10.1007/s10096-017-2982-z.